Inclusiveness appreciated! Given the chance for a do-over, I'd be all over the typewriter repairs and sales business. I try to use the gender-neutral "typewriter technician," even though traditionally it's certainly a male-heavy field. Richard, I believe you covered the experience well. I have two additions. First, when opening a business find a local, trusted accountant to help you with the basics of opening a business, tracking sales, debt, etc. A former school IT Director here ... I had no clue how to manage or run QuickBooks! Second, use your home as your startup unless it is important to have a storefront. Your cost of doing business (overhead) can eat away at profit. A home business gives you a lot of hidden tax benefits! Home Business is a +++. 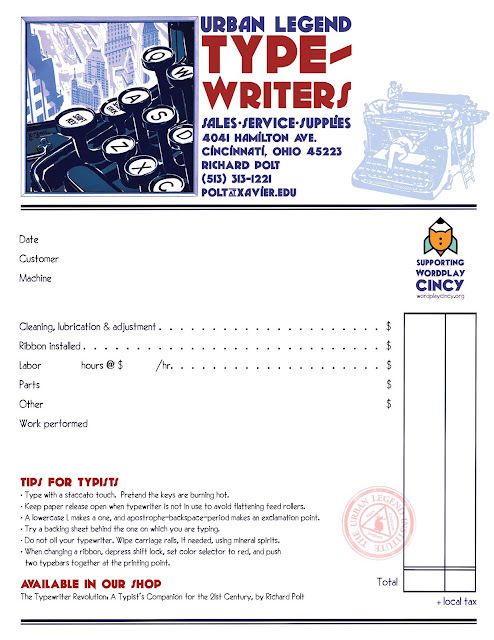 I might add that 5 of the 6 listed typewriter repair shops in Indiana were still active! Good News! ... But, the downside .. in all five cases the owner is planning retirement or is past the age of 70. Within five to ten years, these five shops will be closed. Yikes! Yes, indeed! A home office is exactly the right start. Local city markets are a great venue for low-cost, pop-up shops and sales. Great advice Richard. If I could do it I'd spend some time in Philly and take one of Bryan Kravitz's classes due to my lack of experience on many typewriters. Then start collecting tools. True typewriter tools can be quite rare and if on the bay -- very expensive. Useable parts machines are also needed since spare parts are no longer made although some used parts can be found on line. The reality is that we cannot charge what this specialized, rare, artistic work is worth - the actual cost would be prohibitive. For instance, putting 10 hours into a Selectric at $40 an hour just for an overhaul, cough. 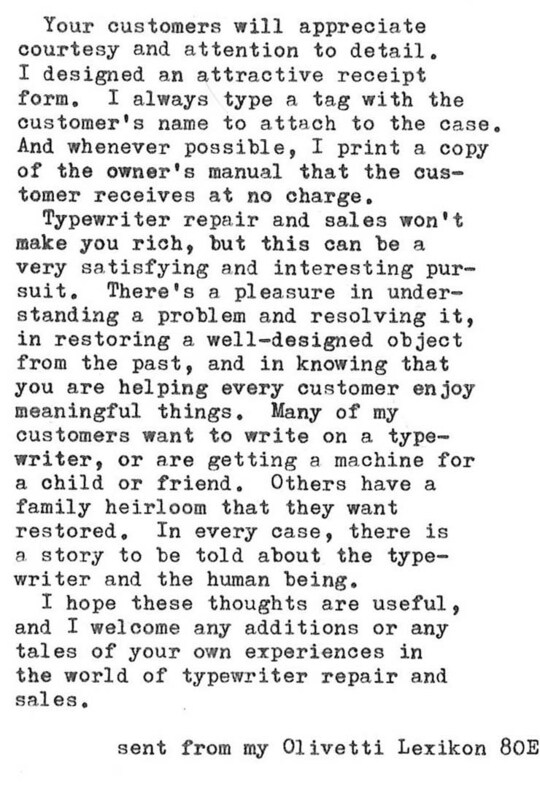 I think the work is *worth* it, but people also have an unrealistic view of typewriter values, the value of a restored machine, and the cost of something in the wild. I think that the Digital Revolution has contributed to people's misconception of the value and cost of a SKILLED TRADE. They tend to project the ever decreasing cost of technology over time with the cost of the fruits of a skilled trade. A typewriter repair in 1960 might have been $20 for a machine that cost $250. Today you can buy a Selectric that cost $1100 in 1984, and to fully restore that machine today, people want to pay under $100 because they got the thing at a yard sale for $20. The reality is that the time, effort, and earned skill means that the total restoration of that $20 machine may be $200 or $500 (depending on parts). In a way the price dynamic has completely flipped, but people just don't seem to be there mentally. It is a challenging dynamic to this whole wonderful topic. Great post! I have been tinkering with typewriters for the past three-four years and am just now beginning to understand them a little. Every junker typewriter that passes through my hands is a big learning experience. I am grateful for the resources on the internet that help me understand and solve typewriter problems. Thanks for this post Richard. It is a dream of mine to open up a small shop one day. I keep myself content with making modest repairs to my collection and selling a machine on Etsy or Craigslist from time to time. 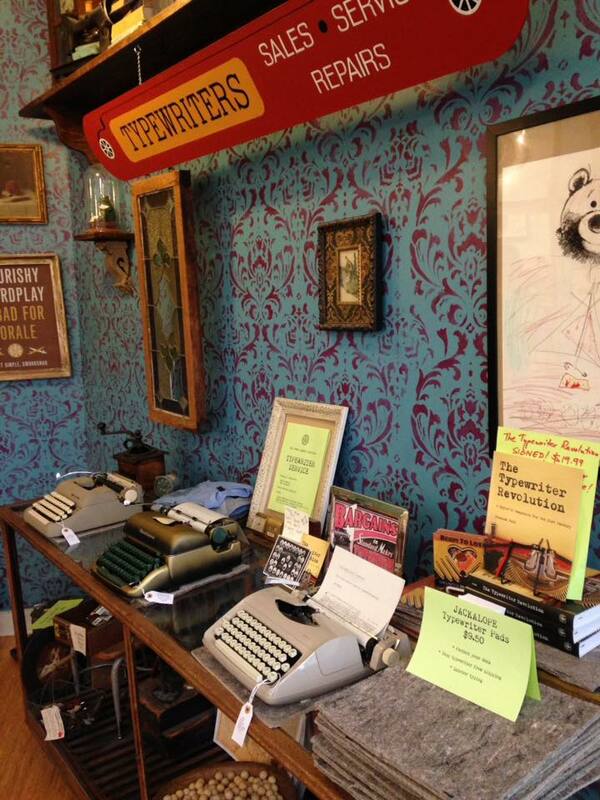 One big reward is the smile on someone's face when they have their first real typewriter. Typewriter pricing is a much debated topic but the reasonable prices you mentioned for vintage, well made machines are put into perspective when you consider a flimsy plastic Royal Epoch sells for about $150 and would leave anyone dissatisfied. 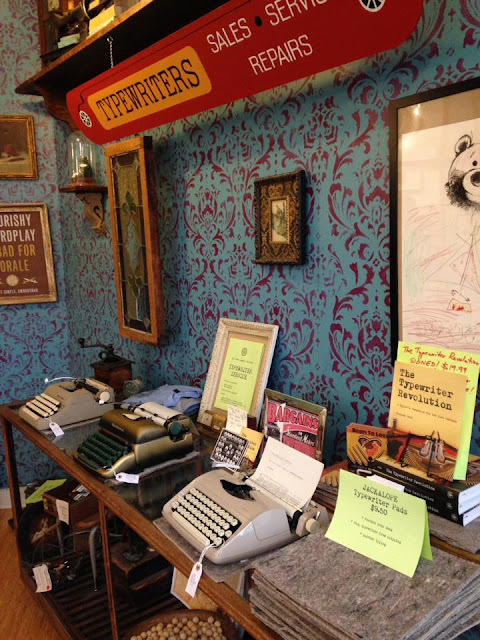 One thing the budding typewriter technician needs to keep in mind that a thriving, or modest, shop will bring you hobby income that the IRS would like to know about as David mentioned above. I wonder if there are opportunities for people looking to get started by buying the business of someone who's going to retire? For example, I know Mark Soderbeck of Vale Typewriter has been talking about retiring in 2-3 years. Very good point. That's what happened in Bremerton, WA (story here). Thanks for the link. I'll keep my fingers crossed for something like that to happen in Minneapolis-Richfield MN.